The first step here was to check out the gun. The gun on this EBR was the SA49, which was as near to an elongated version of Sherman’s M3 (itself a derivative of the French M1897) as made no difference. The same ammunition could be used. Five rounds AP at 1,500m came in with a spread of 32” x 55”. Centered on a point just over a foot to the left of point of aim. So. One can conclude that the gun was serviceably accurate. Sadly, the ‘speed of engagement’ test page seems not to be in my scan, but two ‘unknown distance’ targets do show. Tank at 1,000m, sighted at 950m. Twelve rounds AP fired in 57 seconds, with two adjustments. Ten hits scored. An AT gun was next engaged, turned out to be 1,600 yards, but estimated at 1,400. Seven rounds were fired in 28 seconds. Six hits scored. Bearing in mind it’s not the roomiest or best laid out turret, that’s some pretty quick shooting. Racks for 15 rounds of the total of 51 would be in the turret, 24 would go in the forward driver’s compartment, and 12 in the rear. Split about 15HE, 31 AP, and 5 smoke. Which probably says something about the expected likely targets of the main gun. Fortunately, there were plenty of machineguns to deal with the softer targets. On the other hand, the spent casings bin was only good for six to eight rounds before things started overflowing. The aforementioned machineguns were fed with 150-round drums, but the two in the bows of the vehicle were located under the steering wheels, and were very difficult to manipulate. Stowage for 18 drums all told would be found, 12 of them in the turret. “Large men” of 200-250 lbs, incidentally, would find it very difficult to load the vehicle due to the cramped nature. One of the party tricks to the EBR, of course, is the rear-facing driver. It’s not the first such vehicle, but it is one of the first to have such symmetry. So, a test was conducted to determine the time required under field conditions to stop the vehicle, allow the rear driver to assume driving control, and maneuver the vehicle in the opposite direction until out of sight. The rear driver can take over the controls, stop the vehicle, and move the vehicle forward in the opposite direction with complete driving control without assistance from the front driver either upon signal by interphone communications or when he feels the vehicle out of control (assuming the front driver has become a casualty). The mechanical manipulations by which the rear driver takes over the controls from the front driver are not complicated. After the vehicle comes to a halt, he moves the control lever to the operating position and accelerates. As the front driving wheels (now the rear wheels) trail to a straight-ahead position the wheel spindles are locked automatically to prevent further movement (when intermediate wheels are in a raised position only). One does wonder how that spindle-locking system works if the ‘rear’ driver decides to go in reverse before going forwards to lock them. There was a problem noted with the steering, however, caused by the lowering of the central wheels. Although in theory this enabled four-wheeled steering, and should have tightened the turning circle, it was observed that sufficient weight was supported by those metal wheels to raise the vehicle’s ground clearance by about an inch and thus lifting the body. This meant that there would be much less pressure between the ‘steering’ roadwheels and the driving surface, so whilst there were now four wheels turning direction, the vehicle had a bit of a tendency to drive straight ahead anyway because those big grippy metal wheels just ploughed right on forwards. 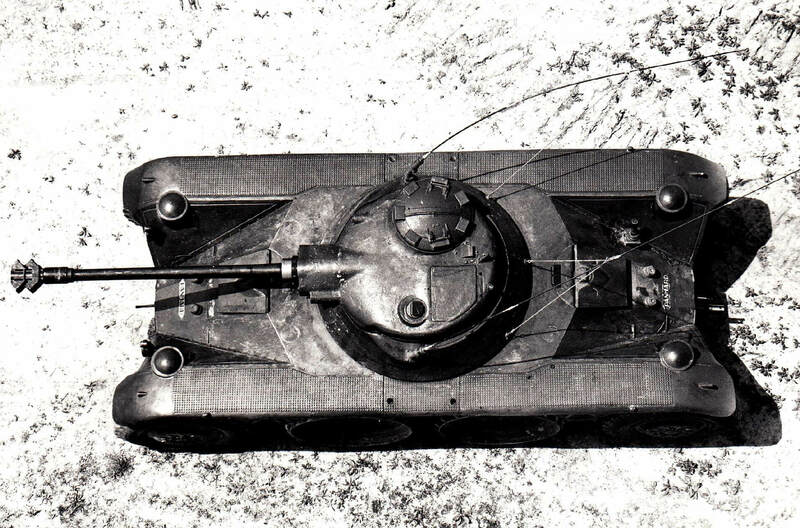 Finally, the big question as far as Armored Force were concerned: Could the EBR do the job of the Light Tank? I’ll just place the pages as scanned below. Yes, the report does seem to be missing the last page of the comparison, #59. The Panhard Armored Car approximates closely the US military characteristics for an armored car. 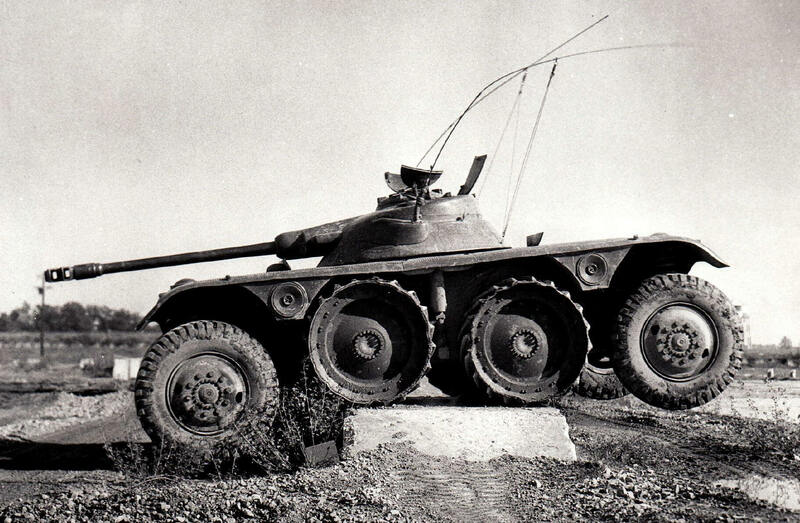 The Panhard Armored Car as tested does not posses the cross-country mobility of a light gun tank. The Panhard Armored Car is not a suitable substitute for the light gun tank. 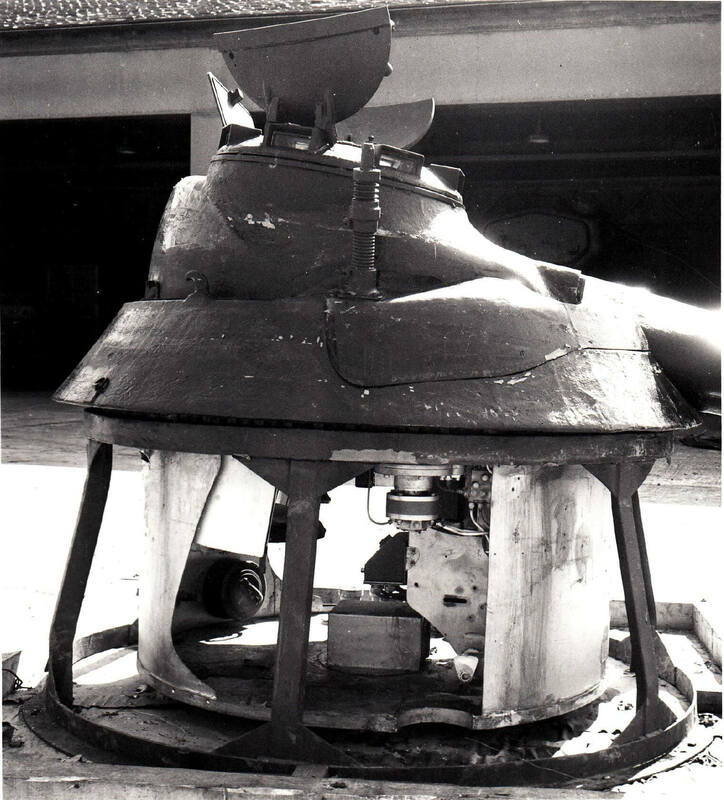 The oscillating turret, mounting a 75mm gun, is a unique and desirable feature. This turret offers many advantages over the conventional turret. The incorporation of both front and rear drivers is a desirable feature in an armored car. The engine has certain desirable design features such as compactness, height, reliability and fuel economy. The 75mm gun, while not equal in fire power to the 76mm gun in the light tank, is an effective weapon for a vehicle of this size and weight. The intermediate wheel design might be improved to increase cross-country mobility. The oscillating turret design, and the front and rear design, be considered worthy of investication for possible application to armored cars of the US Army. The Panhard Armored Car be considered unsatisfactory as a substitute for the light gun tank. Of course, shortly after this evaluation, the US started building some oscillating turret design vehicles, such as T69 and T54E1. One wonders from where they got the idea? This wasn’t the end of the EBR’s tour of the US, though… More to come. Bob vous emmene sur le forum.